Now this is just gross. 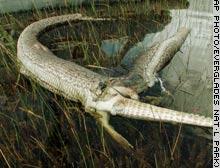 Yes, this is a picture of a python that exploded while trying to eat an alligator in the Everglades. So who do you think won? Seems like a draw to me.